There’s a lot of information out there on running a business. If you’ve been following our posts you know that you should decide whether your stream is a hobby or business and act accordingly. But how do you know what “act accordingly” means for a business? Here are some first, vital steps to take whether you’re a partner, an affiliate, or planning on growing to the point you earn income from streaming. In the U.S (and other countries) the government wants to know who is behind the mask. If your business doesn’t contain your full name then odds are you’ll need to file a “doing business as” (DBA) form with the government to let them know who is running the show. For instance, my personal business is Buff Your Finances but my name’s Galen Herbst de Cortina. When I created the business I had to go to my county and register the name “Buff Your Finances” and associate it with my legal name. So how do you file a DBA? First, check here if you need to do it at all. Some states don’t require you to get one. Even those that do usually aren’t incredibly forceful about making sure every small business not named after the founder has one. LegalZoom has a brief writeup on some of the issues that can come from not filing a DBA. We’ll call this a recommended but not required step. Once you’ve determined that you need to file a DBA look at your state’s website or go through the Small Business Administration’s guide. I also have a bit longer discussion on it here. From personal experience, I can tell you it was relatively inexpensive and quick. There’s hardly anything to say on this, you should just do it. Gmail’s free and works great. If your stream handle is CoolStreamerPerson then you can just get CoolStreamerPerson[at]gmail.com for free, assuming it’s available. This adds some authenticity to your business, helps you obscure your personal email, and helps you keep your personal and business life separate. If you’re in a position where you own your own domain then I’d recommend using your own domain’s address. You can get Gmail (and other) functionality through G Suite for $5/mo. It only takes a few minutes, just do it! This one’s key, regardless of location. You should set up a bank account for your business. It makes life a lot easier in a couple of ways. First, it lets you do transactions in your business name instead of your personal name. Not only does this add an air of authenticity but it can actually help you out by obscuring your name, if desired. Additionally, if at some point you grow to the point of hiring someone then they can also do transactions more easily in the business’s name. Second, it helps separate your business and personal finances. This is key because it makes your life a ton easier come tax time. As we’ve discussed before, you can deduct your business expenses before paying taxes. If you have a good record of all of your business transactions not only will your life be easier during tax time but you’ll probably catch more that you can deduct! This might be a minor differentiator when your stream is small. Just know that as you grow this separation will become more and more important. There are a couple of banks that let you open up accounts with no fees and sometimes no minimums. I like Nerdwallet for looking through these kinds of reviews but you should do your own research as well. In general, you want an account with the lowest fees and minimums and the highest interest rate. Some banks offer deals for opening an account with them so that’s worth factoring in. The final financial piece I like to consider is whether or not it’s easy to get a good credit or debit card on the account. You may not have many business expenses now but if you grow and the expenses grow as well it’s nice to get some cash back on purchases. I’d also highly recommend reviewing their customer satisfaction scores. It can be a huge hassle having to deal with banks. Overall, you want to weigh the financial and convenience factors to pick the bank that makes the most sense. Hopefully, this is a set it and forget it kind of decision. If you’re in the states it is likely your bank will want to see your DBA. So don’t skip that step! You need some way to process tips! 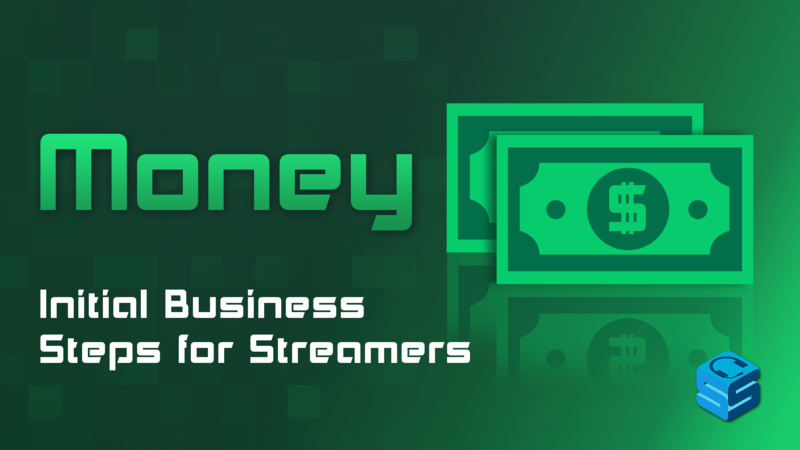 While Twitch can do direct deposit and GameWisp is moving in that direction, tips through third party companies like Streamlabs need some way to process that payment. The default options is PayPal. Luckily, PayPal has a free business account option that keeps your streaming income separated from your personal PayPal. All it takes is your business name (that DBA) and an email. Hey wow, it’s like these things are all related and you did them in a deliberate order! The whole process doesn’t take long and you can walk through it starting here. Once you have that in place not only will people only see your business name and email when tipping you, but you make your business tracking easier. I plan to harp on this over time. If you’re running a business you need to treat it like a business and track statistics. You need to know your income, your expenses, your relevant viewer/sub statistics, and your competition. You also need to know how those different statistics are trending over time. It’s awesome if your income is growing 10% per year but a lot less awesome if your expenses are increasing 15% per year. You can track some of these statistics in different ways. Twitch’s dashboard can give you the raw data on a lot of your viewership stats. It will also include some of the income information on your income but only the income that flows through Twitch. You’ll need to use something else to help aggregate your income from other sources. I’d recommend using accounting software to help you with this- luckily they’re not that expensive. We’ve talked about them before but services like Xero, Freshbooks, and Quickbooks Online are great tools to help you see all of your income and expenses in one spot. And yes, it is absolutely worth it to make a habit of entering in whatever information doesn’t flow automatically. If you do it systematically over the year then you don’t have to panic come tax time. You can also look at other tools like SocialBlade and Twinge to get a better sense of your stream viewership and some projected growth rates. While it’s unlikely you’ll know your exact growth rate it can make for interesting thought experiments if you take what you’ve done in the past and project it out to the future. If you’ve followed some of the previous steps like setting up a business email, bank account, and payment processor then your tracking will be a lot easier. Just sayin’. I’m not a legal expert! However, I know there’s a ton that goes in to protecting your image/brand/company as a streamer. It may be too expensive to get the legal help you need when just starting out. However, you should be aware of the need and planning on the expense as you grow. While there’s no specific tipping point to go by with needing legal help I’d certainly want to make sure I have my brand rights locked down before I went full-time as a streamer. I’m sure there are a couple of firms working in the streaming space but the only one I know of is Morrison Lee. If you want to run an effective company you also need to put on your CEO hat occasionally. By that I mean you need to think strategically and holistically. Where is the business today? Where do you want it to go? How do you get it to where you want it to go? What are your risks along that path? Will you need to hire someone or outsource certain tasks? Do you have opportunities for collaboration that will help the stream? Are you fully utilizing your different potential revenue streams like GameWisp, Patreon, merchandise, affiliates or sponsorships, ad revenue from YouTube, or doing contract work? How will you improve your stream? If you’re just working in the business and spending all of your time streaming then you won’t have time to think through vital questions like this. That’s a recipe for shooting yourself in the foot and stunting your stream’s growth. You need to get in the right mindset as a business owner. I’d recommend reading The E-Myth Revisited. It’s a phenomenal book on running a small business and goes in to a ton of detail. I re-read it every couple of months. Each time I do I come away with something new that I can apply to my business. We covered a lot in this article, but don’t be overwhelmed. Many of these tasks are quite quick and the rest help you save time over the long run. If you want your stream to be a business and a long-term source of income for you then do yourself a favor and get to work. The grind today means a better tomorrow!